Nicklas David, stockroom responsible at Halmstad Energi & Miljö (HEM), came to us with a very interesting inquiry. He wanted to create an integration between MaintMaster and a vending machine to use for consumables. 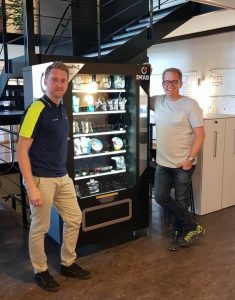 In cooperation with Procurator/International Vending Machines (IVM) and their installator Anders Nyrén, we created an integration. As it turned out, the integration was similar to the ones we’ve done previously with vertical carousel storage systems. For this project a few properties were added, creating big future potential and great customer value. When withdrawing a pair of gloves the withdrawal is registered in MaintMaster and Nicklas can see it immediately. The cost of the withdrawal is registered on the cost center set for the person, and the balance of the item decreases. The vending machine is registered as its own Stockroom in MaintMaster, making it easy to see the items, their balance and costs. For the future Nicklas is planning to have at least 3 vending machines. By using a vending machine, it is easier for all employees to withdraw consumables, a great benefit according to Nicklas. Automatic registration of the withdrawals in MaintMaster also makes it easier for Nicklas to follow up on balance and costs. * Cost center is set for each user and managed on their personnel card.